Today on the blog we welcome resident Osprey author Lindsay Powell. Lindsay's no stranger to the Osprey blog, writing about his previous book Combat 6: Roman Soldier versus Germanic Warrior. Today, he'll be letting us in on how he uncovered the story of what is also known as the Second Jewish War, for his book Campaign 310: The Bar Kokhba War AD 132–136. 'The land of milk and honey' has been a battleground for millennia. Even when supposedly conquered, the native people of what is now known as Israel have risen up again and again to try and oust the occupying powers. Among the most famous rebellions was, as it has come to be known, the ‘First Jewish War’. During this struggle, Roman commander Titus Flavius and his legions destroyed the Temple in Jerusalem in AD 70 and ended their campaign three (or four) years later by crushing the remaining rebels following a siege at Masada. However, it was not the last time the Jews attempted to expel the Romans. There was a Second Jewish War. Waged between AD 132 and 136, it is less well known, but it was actually of greater consequence for the people of the heartland of Israel and for Judaism itself. Confusingly, the same conflict is also called the Bar Kokhba War, named after the man who roused his people to rebellion against the Romans, then led by Emperor Hadrian. 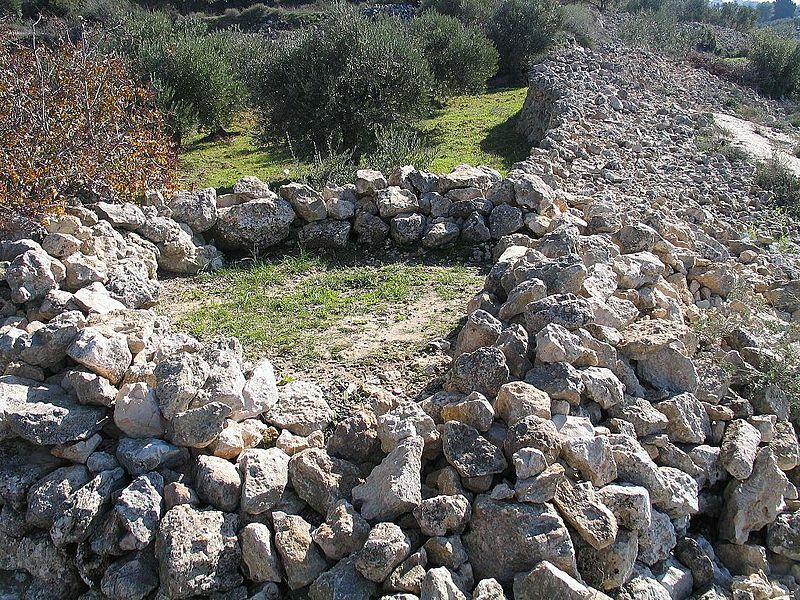 So who was Bar Kokhba? And how did the man who built the Wall in northern Britain respond to the challenger? For a historian and writer these and more questions compel one to dig deeper and follow the trail of evidence in search of the truth – and a good story. I have been fascinated by the Bar Kokhba War for years. My interest in the subject was initially sparked when I read Yigael Yadin's book Bar-Kohkba: The Rediscovery of the Legendary Hero of the Second Jewish Revolt Against Rome (1971). Then a member of The Ermine Street Guard, I wrote an article for the re-enactment group's magazine Exercitus in 1987. When The British Museum held its spectacular Hadrian: Empire and Conflict exhibition in 2008, I was thrilled to see artefacts on display in one of the glass cases, which I instantly recognised from Yadin's book. In 2014 I completed a book in the Combat series for Osprey Publishing – Roman Legionary versus Germanic Warrior, 1st Century AD – and was looking for a new subject for a second volume. It occurred to me to write one on the Bar Kokhba War. To my great surprise, there wasn't a book on it in the extensive Osprey catalogue. After pitching the idea in September of that year, commissioning editor Marcus Cowper sent me an agreement. The project to write Bar Kokhba War, AD 132-136 was on! Each book in the Campaign series follows a common structure: strategic situation, opposing commanders, armies and plans, the campaign and the aftermath, which greatly helps in planning the research. Getting the chronology right is essential. A historian first looks to the extant written accounts; however, in the case of the Second Jewish War this is a particular challenge. Unlike the First Jewish War, there was no equivalent of Flavius Josephus who recorded the events of the Second Jewish War in a single narrative. There are Roman sources. Cassius Dio describes the uprising in his Roman History written several decades after the war, and there are remarks about it in the Life of Hadrian in the Historia Augusta. To these 'pagan' sources can be added the early Christian writer Eusebius of Caesarea who quotes Justin Martyr (a contemporary Bar Kokhba) in his Church History, as well as giving accounts for each year of the conflict in his Chronicle. There are also the writings of Orosius, Jerome, Epiphanius and John Malalas who add details to the story. Unfamiliar to me were the Jewish sources. These are the Talmud (Bablyonian and Palestinian) and Midrash (Lamentations) in the canon of rabbinic literature. They are not histories, but religious texts. Interpretations by rabbis about how Torah (the first five books of the Bible) can be applied to life, they reveal not only details of the conditions of daily life in cities, towns and villages, but also the range of political thought and messianic hope in circulation at the time of the war. Archaeology has uncovered contemporary inscriptions, coins, arms and armour – some of it Roman and repurposed by the Jewish rebels. Much has been discovered about the Bar Kokhba War since Yadin wrote his book. Amazingly, his explorations in the 1960s found fragments of letters in caves near the Dead Sea (which were occupied by refugees at the end of the war), some written and signed by Bar Kokhba himself. New translations of this correspondence between the commander-in-chief and his deputies reveal how he conducted his war. Such details are normally denied to historians of other ancient world campaigns. The letters also reveal the real name of the Jewish warlord: Shim'on ben Koseba. How and why he received his nom de guerre Bar Kokhba, with its messianic connotations, is an important theme explored in my book. One of the great joys for me personally of preparing to write a book is doing the field research. In June 2016 I went to London and met Thorsten Opper, Curator of Greek and Roman sculpture who had organised the Hadrian exhibition at The British Museum. He gave me his perspective on the emperor, his life and times. Months before, he had shipped the iconic bronze portrait of the emperor found in the Thames River to the Israel Museum, Jerusalem. 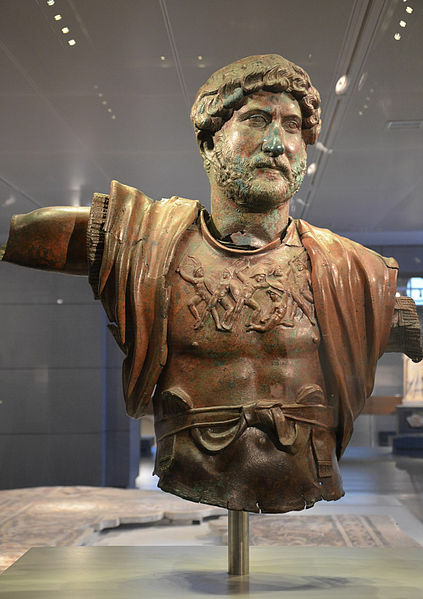 Whilst there, it was exhibited alongside a bronze bust from the Louvre, Paris and another from Tel Shalem, Israel in an exposition called Hadrian: An Emperor Cast in Bronze. By an amazing coincidence, the Eretz Israel Museum, Tel Aviv, was hosting an exhibition entitled Bar Kokhba: Historical Memory and the Myth of Heroism. The opportunity to see both was too good to pass up. That weekend I flew to Israel. In Jerusalem I met Dr David Mevorah, Senior Curator of Hellenistic, Roman, and Byzantine Archaeology, Israel Museum. From him I learned about Hadrian's involvement with Judaea. I was excited to rediscover artefacts that had been displayed years before in London and a great many more I was viewing for the first time, including letters signed by Bar Kokhba. In Tel Aviv I met with staff of the special exhibition, organised by museum curator Sara Turel. They explained to me what is known of the historical Shim'on ben Koseba: how his reputation changed after his death, its long-term impact on Judaism and the struggle to found a modern Jewish state. The insights of these experts greatly informed my knowledge of the causes and antagonists of the war. The famously bearded emperor Hadrian, an experienced commander with a reputation as a disciplinarian, was also a cultured and well-travelled man who struggled to overcome the provincial Iberian accent with which he spoke Latin. He had a plan for rebuilding Jerusalem, which had laid in ruins since the First Jewish War. Ben Koseba was a tough, uncompromising leader (‘murderous and bandit-like’ according to one Roman writer’s assessment), but he was also a devout Jew who observed the holy days and expected the same of his followers. He did not like the emperor's plan for Jerusalem – or Hadrian's other big ideas that would impact his people. Clearly the Roman Empire was not big enough for the both of them. Here was my compelling story. While in Israel, I travelled widely across the Judaean Shephelah and Judaean Desert, taking photographs – many of which appear in the book – of archaeological sites and landscapes where Jew and Roman had once fought each other. Particularly memorable was a visit to the fortified village at Horvat 'Ethri near Beit Guvrin and its hideout caves below ground. The settlement was besieged and razed by Roman troops during the war, a fact attested by the discovery of rebel coins, which had fused together in the intense heat of a conflagration, and human bones which showed evidence of trauma inflicted by weapons. I could not enter the refuge caves in Nahal Hever, near Ein Gedi, which are out of reach to visitors, but I was able to view the majestic canyon with its 370m (1,213 ft) high cliffs from the shore of the Dead Sea – the lowest elevation on land in the world. Both visits informed my guidance to illustrator Peter Dennis, whose dramatic paintings of these locations appear in the Campaign book. 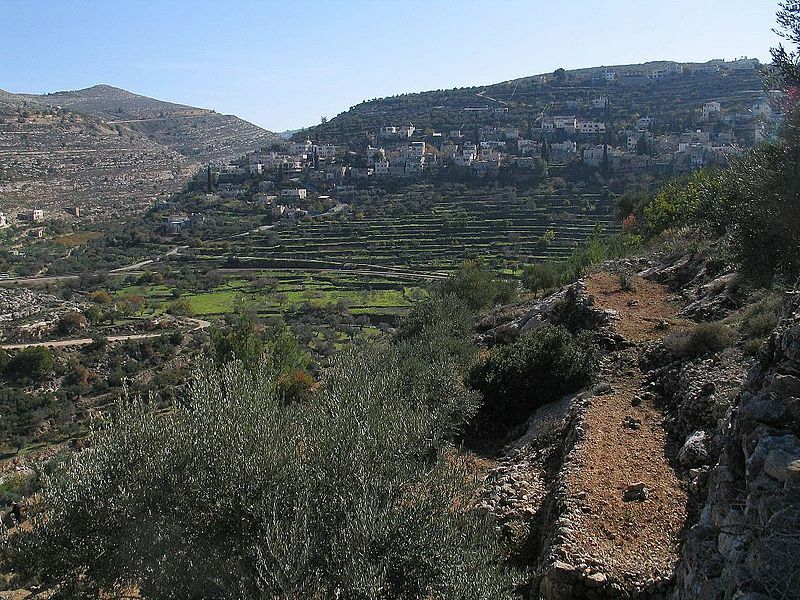 In the final chapter I have described places connected to the war that can be visited in Israel and the West Bank. This mixed assortment of evidence, and making sense of it, poses several challenges for a historian of the war. As I state in the Author's Note, the book represents my best attempt to build a coherent narrative of the events of AD 132 through 136 and I readily accept that it cannot be the final word on the Bar Kokhba War. Scholars still debate, for example, which additional legions (augmenting the two permanently stationed in Judaea) and auxiliary units took part, the degree to which Hadrian was personally involved in deciding the military strategy, how that was executed on the ground, and how much territory was engulfed in the war. What is clear is that, whilst pitched against this professional force, the Jewish army was a citizen militia of lightly armed men, relying on bows and arrows and slings and stones. The rebels fought a guerrilla war, using their knowledge of terrain and hit and run attacks to defeat a much better equipped, highly trained army. Bar Kokhba's men emerged from hideouts dug into the ground and, as quickly, disappeared. Hundreds of these subterranean structures have been found across Judaea. For three-and-a-half years the rebel leader created an independent and functional Jewish state within the borders of the Roman Empire – coins and weights issued by the rebel administration attest to this. Despite the high stakes, the Jews following Bar Kokhba believed that, as their King Messiah, he could establish a Land of Israel and free the city of Jerusalem; their revolt was the way to redemption. In the eyes of the Romans, their act was sedition, a direct threat to established law and order; it had to be neutralised and the culprits had to be punished. The initial response of the Roman governor of Judaea and his provincial army was ineffective. Hadrian approved what would now be called a 'troop surge', yet the Jewish insurgency still repelled efforts to defeat them. Hadrian then dispatched his governor from province Britannia, hoping he could change the calculus. The expeditionary force he deployed against Bar Kokhba included thousands of troops drawn from all over the empire – including auxiliaries and a high-ranking officer from their base at Maryport, Cumbria! As in the First Jewish War, there was a last stand. The dramatic end of the Second Jewish War occurred not at Masada, but at Betar, a hilltop town located 11km (7 mi) south-west of Jerusalem on the Roman road to Gaza. The siege is explained in a Bird's Eye View schematic in the book, and depicted in another dramatic artwork by Peter. In the aftermath of the war, Judaism itself changed. From that time on the Jews rejected military action as a means for liberation and instead sought an accommodation with the Romans. The war of AD 132-136 was the last Jewish revolt against Imperial Rome. The Jewish holy days of Tisha b'Ab and Lag b'Omer, still marked in the twentieth century, are directly connected to the war in the second. Bar Kokhba remains an important historical figure in Israel today because he was the last leader of a Jewish state before the rise of Zionism in modern times. Indeed, it could be said that Bar Kokhba's dream was not fulfilled until the State of Israel was founded on 14 May 1948. The Bar Kokhba War reminds us that freedom is not free. To gain it and hold on to it often comes at a high cost- in blood and treasure. As I was coming to the end of writing the first draft of the book the news media reported on a terrible tragedy. On 7 July 2016, a man opened fire upon a group of police officers in Dallas, Texas, killing five officers and injuring nine others. Living in Austin, Texas, it was close to home. As the book went through the final stages of production and printing in early 2017 there were other tragedies. In the UK police and civilians were murdered in London, Manchester and London again. Other countries suffered similar calamities over the same period. It is customary for an author to dedicate his book to a person or cause. Following that Texan massacre I decided to dedicate my book to ‘the men and women of the armed forces and police who put their lives at risk every day to defend our freedoms of speech, movement and association'. Despite their differences, I have no doubt that Shim'on ben Koseba and P. Aelius Hadrianus would have approved. Corrigendum: on page 61 of the book the name Kirbet 'Ethri appears. This is the Arabic name for Horvat 'Ethri, which is the form used for the fortified village elsewhere in the book. Lindsay Powell is a historian and writer. His articles have appeared in several magazines including Ancient Warfare, Desperta Ferro and Strategy and Tactics. Among his acclaimed books are Eager for Glory (2011), Germanicus (2013) and Marcus Agrippa (2014). Visit his website at http://www.lindsay-powell.com. The Bar Kokhba War AD 132–136 is Lindsay's second book for Osprey and will be published 27th July 2017. You can preorder now by clicking on the title link. Thank you for sharing your interesting account. Few know how epic the adventure of writing an Osprey book can be. Looking forward to this book for my collection. In a time of no major wars for a number of years and a so called golden age for Rome this did come as a shock to Rome and as the author says the rebellion was an act against lawful governance. Not a lot changed for the Jews in how they fought the Romans from the first Revolt to the second did it?